This week is our second episode on the actions in the Middle East during 1915. Last episode was all build up, but this week we will be spending most of the time discussing two attacks in different parts of the theater. 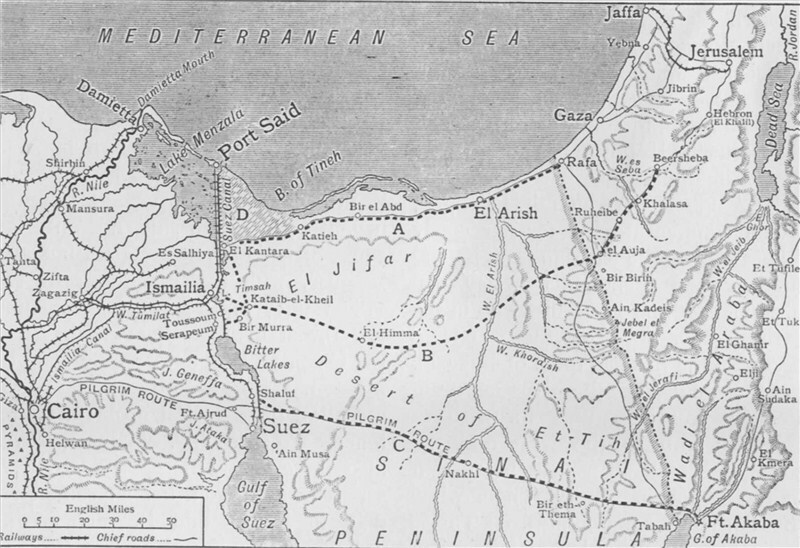 The first attack will be the Ottoman attack launched against the Suez Canal which would require them to cross the Sinai desert. We will then turn our eyes to the theater that we will spend the rest of this episode and all of next episode discussing, the areas around the Tigris and Euphrates rivers in Mesopotamia. I mentioned last week that the British government had declared Egypt as a protectorate after Ottoman entry into the war. This was not done instantly on November 5th though, there was actually some discussions among British leadership of outright annexing Egypt and making it a part of the British empire proper, but it was decided that this might not be such a great idea. The biggest concern was that the Egyptians themselves might not be too happy about it, after enjoying at least semi-autonomous status for so many years. The Consul General of Egypt, a man by the name of Sir Milne Cheetham, was also very concerned about the message that the annexation would send to other Islamic groups in the region. Cheetham did not want any of the British actions to look like they were trying to permanently take over any of the land, at least in a formal sense, the goal was to make it appear that the British only cared about ousting the Ottomans, but leaving the people with their freedom afterwards. Because of these concerns the route of making Egypt a Protectorate was chosen and it was formalized on December 19th. Even while discussions on what political technicality would allow the British to have troops in Egypt was ongoing, the priority was always keeping the Suez Canal safe and free of enemy influence. One important step in this process was to make sure that the British had the Egyptian people on their side, nothing would be worse than a rebellion, to this end on November 2nd there was a proclamation from the British leaders in Egypt that made it clear that the British would take care of the defense of the Egyptian country from the Ottomans. The proclamation also included a promise that no Egyptians would be asked to participate in any of the fighting. As part of this promise the 10th and 11th Indian divisions were moved into the country and it would be these two divisions that would form the core of the defense of the canal when the Ottomans would come knocking on the door. These men, and all of the troops in Egypt would be put under the command of General John Maxwell. Maxwell was a career soldier whose first action had been in Egypt in 1882. During his stay in Egypt as commander he would be well regarded by both his troops and the Egyptians. In the book The First World War in the Middle East Kristian Ulrichsen would say "Maxwell was a popular figure with long experience in Egypt, and ensured that his 'tactful yet strong administration' ruled in close accord with the civil administration." Maxwell would become even more well known for an event that he would oversee in Ireland in 1916, you may have heard of it, the Easter Rising. For now though, he was in Egypt and charged with the defense of the Suez canal, and in this he found himself in pretty good shape. He had two divisions which were charged with maintaining patrols on the eastern side of the canal, establishing permanent defenses on the canal itself, and creating several permanent communication links between the canal and the cities of Alexandria and Cairo. All of these tasks would be greatly assisted by the railway that ran the length of the canal and the naval support that would be available from the Royal Navy, which had a vested interest in making sure the canal stayed open for shipping. The Ottoman adventure of 10s of thousands of men and artillery across the Sinai Desert to attack the canal in early 1915 was quite the expedition. The germ of the idea had been planted when Germany began prompting Turkey to at least consider an attack on the canal. The Germans hoped that the Turkish troops would be able to disrupt British shipping, even if just for a little while, through the very important waterway. Once the Ottomans got on board with the idea the stated goal of the attack became to surprise the British defenders and capture a small piece of the canal, this small piece would be defended as long as possible. The commander of the 4th Army, and the commander of the Ottoman troops for the campaign General Ahmed Cemal hoped that the raid would have wider effects "I hoped that the Egyptian patriots, encouraged by the capture of Ismailia by the Turkish Army, would rise en masse, and Egypt would be freed in an unexpectedly short time by the employment of quite a small force and insignificant technical resources." There was also some hope that many nomadic Arab tribesmen would join in the attack once the advance began. Neither the Egyptians nor the Nomads seemed to want to tango with the British at this time though, which left the Ottomans at a distinct numerical advantage if they did reach the canal. Cemal would have just 30,000 troops under his command, with 50,000 British defending against their attack any long term holding of the canal was unlikely. But it would be possible, if surprise was achieved to maybe hold a section of the canal for a few days or weeks. Cemal was joined by a German officer as his Chief of Staff, Colonel Franz Kress von Kressenstein, I only really bring him up because of his name, such a German name. Cemal and Franz Kress von Kressenstein had a goal, but there were two serious challenges that they had to overcome even before you consider the 50,000 British soldiers waiting for them. The first problem was that they had to cross a desert to reach their objective, this desert was also mostly devoid of roads and was over a hundred miles wide. Once the desert was crossed the army would run into the Suez canal which was 8 meters deep and many meters wide, oh and it had those pesky Brits and their silly guns. With these challenges identified, once the army began to assemble in Beersheba work began on the measures necessary to complete them. First was the task of crossing the desert, supply dumps were positioned every 20 miles along the route that the army would take across the sands. These supply dumps not only contained food and other provisions but also had wells and water storage. 10,000 camels were also requisitioned to be used for the crossing. To tackle the canal the army created 25 pontoons specifically built for the purpose of crossing the waters. Each of the pontoons was around 6 meters long and 1.5 meters wide, once they were brought up to the canal they would be used to create a bridge. With all of the preparations completed the crossing began, and over the course of two weeks not a single man was lost to the elements. This is an impressive feat, and stands in stark contrasts to some of the crazy things happening on other fronts, men marching, or trying to, over freezing mountains or knee deep mud. While the Ottomans were preparing for their trip the British had not been idle. They had been improving their defenses around the canal. Fortunately for the British they would receiving warning of the advance of the Ottoman army when it was sighted by a French reconnaissance plane while the army was marching across the desert. The news of the upcoming attack caused the British to make several changes to prepare for their arrival. The first step was to flood areas on the eastern side of the canal. This would cut down on the area of the canal that had to be defended to under half of its original length of 102 miles. This was very important for the British because while they knew that the army was coming they had no idea where they might try to attack. The second step taken was all troops were pulled back from their positions on the eastern side of the canal and positioned on the western side with the canal in front of them. Ore troops were also brought in, specifically some Australian and New Zealand troops that were fresh arrivals in Egypt at the time. The third and final step was the positioning of some Royal Navy warships at important points of the canal to provide fire support should they be required. With these actions the British were as prepared as they could be without knowing where the attack would fall, which it would begin, or exactly how many Ottoman soldiers they would be facing. As the Ottoman troops got close to the canal the army was split into three different groups with the main force focused on crossing at Ismailia which is pretty close to exactly the mid point in the canal. There would also be attacks launched against the far south of the canal at the town of Suez and just north of Ismailia at the village of Qantara. On the day of the attack, which would happen at night, the Ottomans were given a gift in the form of a sandstorm which allowed them to get very close to the canal without being spotted. The storm meant that the British would not know the location of the attack until after it had started. When night fell the conditions were as good as could be hoped for and the Ottoman troops began attempting to assemble the pontoon bridge across the canal. It was absolutely critical that the bridge be assembled before dawn, after it became light the chance of discovery by the British was an almost certainty and the engineers on the bridge would be sitting ducks. Unfortunately for the Ottoman's the construction took far longer than they expected and they were eventually spotted by a British patrol which spread the word along the canal. The Ottomans found themselves under fire with only a portion of the bridge erected. Fahmi al-Tarjaman, an Ottoman Soldier, had this to say about what it was like near the canal "The bullets were all over, hitting and exploding in the water and making the water of the canal churn like a kettle of boiling water, the boats were hit and started sinking and most of our men could not shoot back although those who could did." All of the Ottoman troops near the crossing were extremely exposed to British fire, fire from prepared and protected defensive positions. The fighting continued throughout the day, all the time the Ottomans continuing to attempt their crossing while also engaging the British. Every hour that past drastically reduced the probability of success for the attack, every hour British reinforcements arrived. After a day of fighting the Ottoman commanders made a wise decision and decided it was time to retreat, as evening fell on the battlefield the Ottoman army disengaged and retreated in the direction from which they had come. The total cost of the attack was about 1,500 casualties for the Ottomans, of which 700 were counted as missing. The British had lost only 250 men. The end of the attack was also the end of the Ottoman hopes of seriously attacking the canal, something that the British didn't know of course. Over the coming year the British would spend time creating a line of fortifications in front of the canal along its length, there were three lines of defenses, very nice defenses, that were all destined to not be used. The only real outcome for the Ottomans was the increased effort and manpower that was thought necessary to defend Egypt for the rest of 1915 before other actions in the Middle East made it unnecessary, so I guess you could consider the attack a partial success. While the Ottomans were on their way to the Suez Canal the British were not idle in another theater of the war, Mesopotamia. Leaders in London believed it was critical that they get British soldiers on the ground in the Middle East as soon as possible after the war started. This, it was hoped, would keep up British prestige in the region, provide security for British influenced protectorates like Kuwait and Bahrain, and prove to all of the local Ottoman leaders that the British meant business. As always, British prestige was high on everyone's mind and not just out of fear of the Middle East but also for British holdings in India as this 1903 editorial from The Times explains "If we lose control of the Gulf, we shall not long rule in India…The moment it became known that Russia, or Germany, Or France, or any other powerful nation, had planted a post within easy reach of the shores of India, an impression of the impermanence of British rule would be produced throughout Hindustan." Now, even though there was widespread agreement that something should be done, as always, there was disagreement about the specifics. There was disagreement between London, Cairo, and India that revolved primarily around differing outlooks on what the campaign should look like and what its goals should be. These disagreements would not be resolved by the beginning of the campaign, and would not truly be settled until the end of the war. It was decided to invade and in early August 1914 plans about what the invasion would look like began to coalesce. The details were hashed out over the next two months, in strict secrecy and they revolved around an invasion of Mesopotamia starting with the city of Basra. The British would start their campaign by capturing Basra first for geographical reasons, it is near the conflux of the Tigris and Euphrates river, but there were many other reasons as well. First was Basra's loyalty to Constantinople, or lack thereof, Eugene Rogan called Basra's loyalty "Lukewarm at Best" in his book The Fall of the Ottomans. Basra's economy was also closely tied with Britain and especially India, in fact, 2/3 of the trade that passed through Basra was controlled by the British. The Ottoman's, aware of these reasons, declared martial law in early August 1914 and in September more troops were brought in and under the orders of officials in the city began constructing defenses near the city nd on the waterways that led to it from the Persian Gulf. The Ottomans also began to try and persuade local tribal leaders to join in the defense of the city, something that was almost required to have any hope of holding the city. This possibility was a huge concern for the British, if all of the locals joined against them not only would it be drastically more difficult from a manpower perspective but also from a supply line security perspective. To try and counteract the Ottoman efforts a message was sent by the British to all of the tribes friendly, or mostly friendly, to the British when war was declared that read "Your relations with Great Britian are of long standing and I take this opportunity of assuring you that, in this struggle, we shall do our utmost to preserve for you your liberty and religion." This message, and other British efforts would help to keep most of the local population at least neutral for the opening actions of the campaign. After Basra was pinpointed as the target the challenge became how to preposition troops as close as possible before the war started so that they could be deployed quickly, before the Ottoman's had time to respond. The first precaution taken to keep the operation a secret was to not even tell the commander of the Indian troops earmarked for the attack where he was going. Brigadier General Delamain believed that he and his men were headed to the Western Front, but when they got to the sea he found out they were headed for Bahrain instead. After spending some time in Bahrain Delamain made the decision to move his men slightly further north with the goal of protecting some of the oil refineries in the region. By moving his troops further north Delemain was able to get his troops into Ottoman territory less than a day after the declaration of war. Early the next month, on November the 6th, the first shots of the campaign were fired by the HMS Odin at some Ottoman defenses on the Shatt el-Arab. The Shatt el-Arab is a river that runes from the confluence of the Tigris and Euphrates, past Basra, and into the Persian Gulf. The troops under Delemain landed on the 7th of November and established a firm beachhead at the end of the Shatt el-Arab. At this time Delemain had only one Brigade with him, just around 5,000 men, not very many when invading a foreign country. Once the beachhead was established the plan was to wait for further reinforcements, probably until the entire division could be landed. While the British and Indian troops were on the edges of the Shatt el-Arab the experience was unique as explained by Eugene Rogen in The Fall of the Ottomans "The British and Indian troops had to defend themselves in an alien environment that discouraged bold movements. Sudden drenching rainstorms truned the banks of the Shatt into quagmires of mud, while strong winds whipped up sandstorms that cut all visibility and signal communications.. Mirages proved one of the most perplexing natural phenomena for the troops, making visual identification on the battlefield almost impossible." Even though the plan was to originally wait for the entire division after the 18th Brigade arrived London authorized Delemain to use his discretion on if he should advance further. Delemain believed he now had enough troops to start the next step of the plan and on the 14th of November the advance began. Over the next week there were many small skirmishes but every time Delemain and his troops beat up on the Ottoman defenders and pushed them back. By the 21st the Ottomans were in such a bad shape, especially their morale, that by the 21st the Ottomans decided to abandon the city of Basra to the British. When the British arrived in the city the first thing that they did was guarantee the freedom of all of the residents, but not all of the residents of Basra instantly welcomed the British invaders. Basra had been ruled by the Ottomans for hundreds of years and many of the people found it difficult to believe that they would never be back. 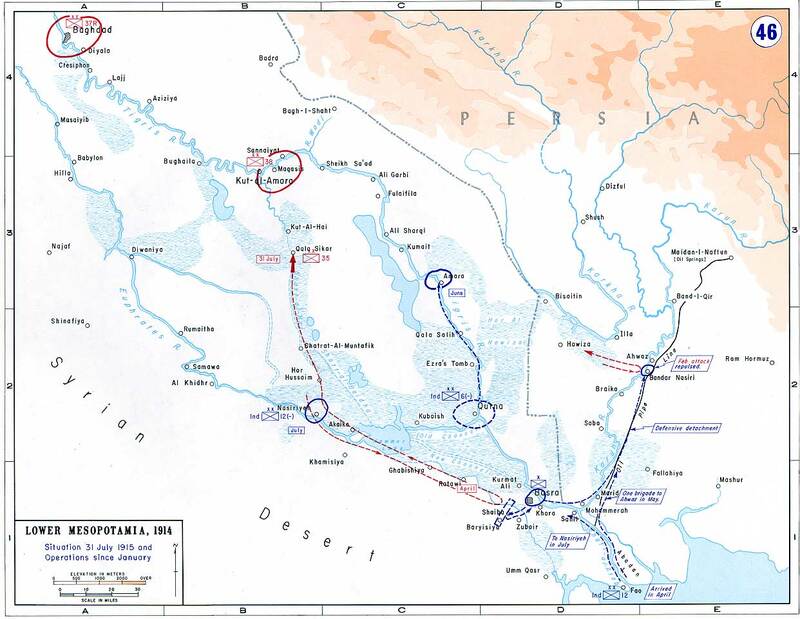 Now that Basra was in British hands all of the immediate goals of the campaign were accomplished, but since it was so easy the British did something they would do several times in Mesopotamia. They began to look at how easy it was to come this far and decided, what the hell, lets go a little further. This decision was driven partially by the desire of the British leaders to not look too passive, they wanted to continue to maintain an offensive footing to appear strong, sort of a way to just say in big bold letters "Don't mess with us." The next city in their path was Qurna, which was at the juncture of the Tigris and Euphrates rivers. This would put the entirety of the Shatt el-Arab under British control and cement their position at the head of the Persian Gulf. To accomplish the capture of Qurna two shallow draft ships were used to ferry the troops upriver, an operation that took several trips over the 50 miles between Basra and Qurna. The first attack was made by the British on December 4th but it had to be abandoned while still in progress due to lack of supplies and equipment. The biggest problems was that they didn’t' have enough animals to keep the attackers supplied during action away from the river, especially once they began to run into heavy resistance. This shortage of pack animals proved to be a limited time problem though and on December 9th another attack was launched and the city quickly surrendered. With this second goal accomplished the British stopped and consolidated their position while more men were brought into the theater and it was decided what to do next. Up to this point the British had only suffered a total of 775 casualties with the Ottomans having suffered over 3 times that number. The British had completely caught the defenders off guard, but they were regaining their composure quickly. More Ottoman troops were moving into the area, and it forced the British to start moving in more Indian troops as well, there would be another division in Qurna before the end of the year. As the number of soldiers increased the theater settled down for a bit, until the British launched their next attack. Which we will talk about next episode as we follow the British as they make huge advances before, they go a city too far.